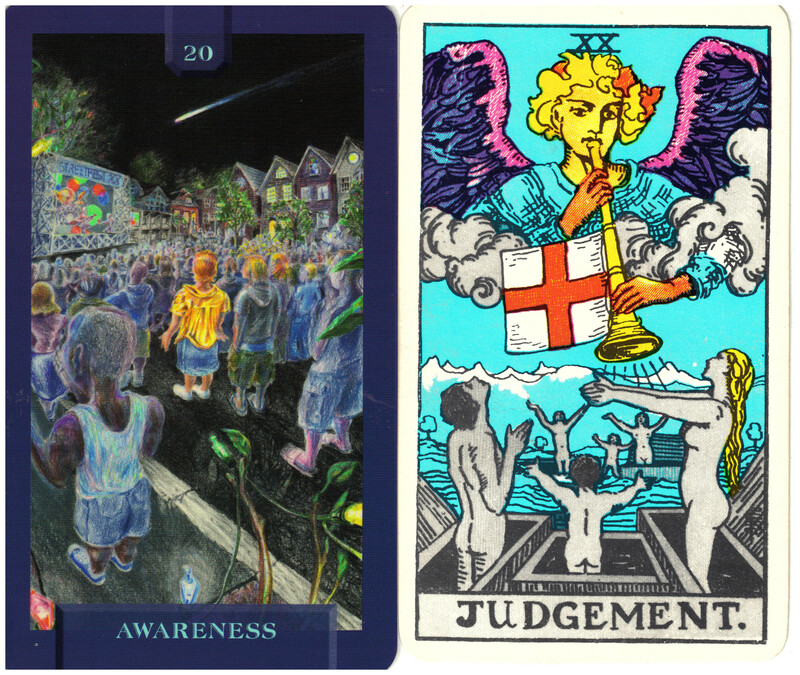 The Judgement card in the Rider/Waite/Smith deck is often associated with just that, judgment. But it doesn’t represent judging as much as it does awakening and awareness. Perhaps it does refer to the proverbial “Judgment Day” when we are supposed to come face to face with our lives and receive retribution for our “sins”. The card’s central figure is the archangel, Gabriel blowing his horn. There are gray and naked people rising out of coffins with their arms raised to the angel. Today’s Journey Tarot’s updated version of this card is titled Awareness. The idea here is that something will awaken us to a level of understanding that we didn’t possess before. We may judge our former selves, before we were aware – but at this level of awareness I think that would be unlikely. How can we judge ourselves for what we did not know? Awareness shows a neighborhood block party. All of the participants are engaged in watching a performance on stage. Only one woman becomes aware of a shooting star across the sky. She has reached a new level of consciousness with this recognition which takes her out of the mundane world and into the divine.